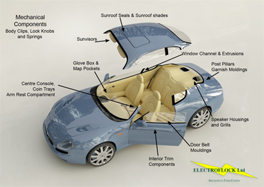 The uses of Flock in the Automotive Industry are many and various, from Compartment Storage Components. Our Reel to Reel extrusion line can flock any quantity from hundreds to thousands of metres of your extruded profile. By specific application of the flocking process, almost any shape can be flocked, from automotive glove boxes to large display stands. Using our Flatbed flocking plant we are able to flock a multitude of different substrates - foam, metal, cardboard and plastic. Chandeliers or other lighting fixtures to provide a surreal and eye-catching spectacle.